SEE ALSO: BEYOND THE SOLAR SYSTEM -- HOW BIG IS THE MILKY WAY? Venus is the second closest planet to the Sun. It is a terrestrial planet. This means that we think it was created in a similar way to our planet Earth. Venera 7, the first space probe to land on Venus, was put out of action by the hostile conditions on Venus after only 23 minutes. Almost all of the surface features on Venus are named after women. 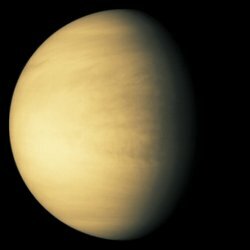 Venus is about 67,237,910 miles away from the sun. Venus is almost the same size as the Earth. This is one reason why Venus is sometimes thought of as Earth's "twin". Venus has a diameter of about 12,100 kilometres (km). The surface of Venus is very different from the surface of the Earth. It is very, very dry and hot enough to melt lead. The pressure on the surface is very, very strong. It is the same as being 1 kilometre below the surface of the sea on Earth. 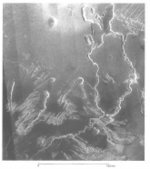 Channels that look like rivers have formed on Venus. Scientists think these channels are formed from erupting lava. The lava flows along as it cools down, creating the channels. One feature only Venus seems to have is unusual volcanoes called arachnoids. These are volcanoes that have formed differently from other volcanoes we have found in the Solar System. We don't know exactly how they were formed. Venus also has volcanoes like those on Earth. Parts of the surface of Venus look something like continents. The largest of these areas is called Ishtar Terra. Deep basins like those under the Earth's oceans have also been discovered. On Venus, though, they have no water. Features like mountain ranges and meteor craters have also been found on Venus. 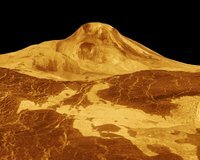 One of the highest mountains on Venus, Maxwell Montes, is about 11 km taller than Mount Everest, the highest mountain on Earth. Venus rotates (spins around) even more slowly than Mercury. One day on Venus is about 243 Earth days long. Venus also rotates in the opposite direction to the other planets in the Solar System. One year on Venus is almost 225 Earth days long. So, one Venus day is longer than one Venus year. Like Mercury and Earth, Venus is made of an iron core surrounded by rock. How much would Venus' gravity pull on me? If you were on Venus, it would pull you down almost as strongly as Earth. Venus is named after the Roman goddess of love. Sometimes it can be seen shining brightly just before dawn or just after sunset. Some peoples, like the Aztecs and the Greeks, gave Venus two names â€“ one for the morning and one for the evening. 2. Venus is located between what two planets? 4. What is the surface of Venus like? a) It is very, very dry and hot enough to melt lead. 5. Venus is named after which Roman God?